It’s a truism that every investment or trade off in life is a bet on one thing against another. Moreover, risk is inherent in every decision made. Without due diligence and a proper strategy, any action is only as good as a wild gamble. Like in all other facets of life where a reasonable person is expected to deliberate and think through before making a choice one deems best, trading and investing in equity requires one to have a clear idea of what one’s getting into, an executable strategy that accounts for foreseeable developments and an exit plan if things go awry or if a downturn is around the corner. Risk management lies at the core of good investing practice. It’s absolutely essential that one knows how to manage and reduce risks effectively before investing or trading in equity. A systematic risk refers to the chances of a generalised downturn across categories or sectors of equity. Short term trading is fraught with much more volatility and risks than long term investments. Unsystematic risks are those that are peculiar to a particular stock or a class of stocks. The price often fluctuates between set levels, with the baseline called a support and the ceiling, a resistance. Discussed below are risks one has to confront as a trader/investor and measures to mitigate risks which pave the way for a better shot at making profits. As the term makes it obvious, a systematic risk refers to the chances of a generalised downturn across categories or sectors of equity. These developments are often sudden and unpredictable. They could include an adverse political scenario, an economic crisis (for instance, an economic recession) or social unrest. The market reacts with panic after the development breaks, because often there’s little clarity at the beginning. Prices take time to settle until after details come out and the scope of the systemic changes become clear. Though these events are mostly unpredictable and might seem to occur sporadically, an intelligent investor who stays up-to-date about the wider scheme of things will often find cues on what to expect and can enforce countermeasures such as selling off short term equity holdings. One might even be able to profit by taking short positions on stocks. The best defence against a systematic downturn that lasts long is diversification of investment in assets which thrive when the markets don’t perform well, such as gold, physical assets like real estate and government securities/credible bonds. For example, a company might fail to perform well, reach objectives, projected earnings etc. These risks can be foreseen in most cases from an analysis of a company’s historical performance, earning reports and records of asset holdings and outstanding debt, vision for expansion and projections of future prospects. Thus, a fundamental analysis[Link # 71 – What is Fundamental Analysis and how to do it?] helps investors to assess the risks of investing in a particular stock or a class of stocks, thereby enabling one to settle on the best bets. Again, it’s good practice to diversify across different classes of stocks to mitigate risk in the event that an unforeseen occurrence impacts a particular stock or a group of related stocks. Short term trading is fraught with much more volatility and risks than long term investments. Short term price movements of a stock are independent of a company’s underlying fundamentals most of the time. The price fluctuates based on the demand supply dynamic and is also very sensitive to external developments, such as news that could impact the company’s prospects. The price often fluctuates between set levels, with the baseline called a support and the ceiling, a resistance. Demand goes up when the stock is near its support and selling increases near a resistance as traders anticipate prices to stay within the limits and trade accordingly. These levels are breached when investors demand or sell a greater number/volume of stocks than is normally traded in reaction to news that could have a bearing on the company’s prospects. The stock then settles in a different price range with a new resistance and support. Thus, there are multiple resistance and support levels across price ranges. Historical trends: which allow for observation of supports which have held up prices and resistances which contain prices from going up beyond a certain level. Moving averages: a convenient tool used in technical analysis wherein multiple day price averages are used to identify supports and resistances. 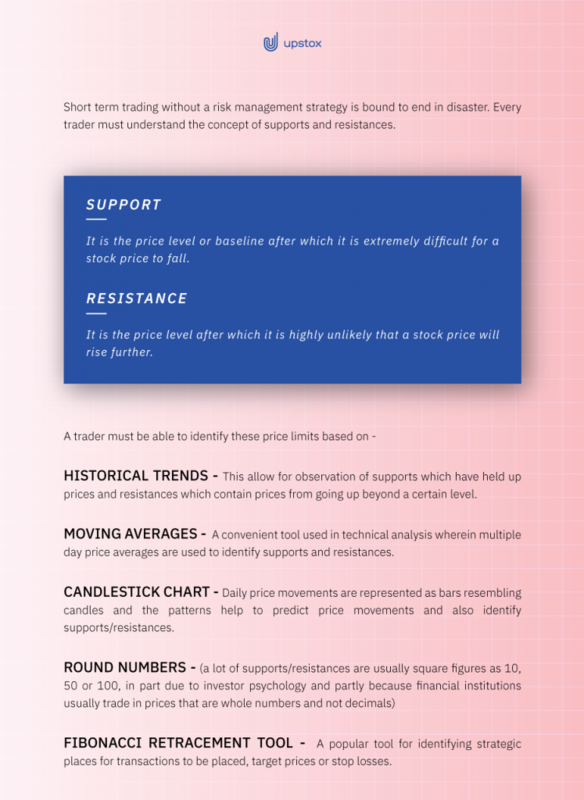 Candlestick chart: daily price movements are represented as bars resembling candles and the patterns help to predict price movements and also identify supports/resistances. Fibonacci retracement tool: A popular tool for identifying strategic places for transactions to be placed, target prices or stop losses. After determining support-resistance levels, traders can decide when to sell their holdings, either to make a profit before a likely downtrend, or to cut losses at the start of a likely protracted fall in prices. Similarly, stocks can be bought at near support prices while limiting bids at higher prices near the resistance level. The short term trader also has to be mentally agile enough to accommodate new developments and modify trades based on the weight of breaking news. Further, large institutional traders often use automated algorithms which manipulate or distort market trends, making short term trading even more risky. One can also watch out for rallies (a consistent up or downtrend over a reasonable period of time, usually a few days or weeks) to make short term trades with a relatively lesser degree of risk. Enables investors to identify the best investment options in the market offering higher likelihood of great returns relative to risk. Reduces risk of incurring losses significantly by means of diversification across stock classes and different asset categories. Informs trading strategy, that is, determination of prices at which to buy or sell. Though risk management practices can never reduce the risk to zero (in fact, risk is never non-existent with anything), proper planning can significantly cut down risks and considerably boost the chances of profiting off investments. All it requires is effort and willingness to learn on the part of the investor. Adoption of risk management practices is absolutely essential to reduce the risk of incurring losses on investments. Systematic risks, which are risks threatening the whole market, can be hedged by investments in alternative asset classes. Stock specific risks can be reduced by proper fundamental analysis and scrutiny of stocks before investing. Short term trading is more risky than long term investments and thus traders need to be much more cautious and vigilant. Every trader or investor must have a market entry/exit strategy to cut losses and maximise profits.